Udaipur (not to be confused with the famed city in Rajasthan) is a town and a municipal council in the state of Tripura. This city is famous for the Tripura Sundari temple also called as the Tripureswari temple. It is also the headquarters of Gomati district. Udaipur is about 55 km from Agartala, the capital of Tripura. In Aug 2016, Railway Minister Mr Suresh Prabhu inaugurated the train 14019/14020 running a distance of 2435 km in 46h 50m – named Tripura Sundari Express, running between Agartala and Anand Vihar. Trains first reached Tripura in 1964 when the railway was extended to the state's northern business hub, Dharmanagar. Later it was extended further to Kumarghat. The foundation stone of the 119 km (74-mile) Kumarghat-Agartala railway project was laid in 1996 ~ it has taken years to connect capital Agartala by rail with other parts of the country. Tripura, in Northeast India, is the third-smallest state in the country, it covers 10,491 km2 (4,051 sq mi) and is bordered by Bangladesh, Assam and Mizoram. The area of modern 'Tripura' was ruled for several centuries by the Tripuri dynasty. It was the independent princely state of the Tripuri Kingdom under the protectorate of the British Empire which was known as Hill Tippera while the area annexed and ruled directly by British India was known as Tippera District. The independent Tripuri Kingdom (or Hill Tippera) joined the newly independent India in 1949. Tripura lies in a geographically disadvantageous location in India, as only one major highway, the National Highway 8, connects it with the rest of the country. Five mountain ranges—Boromura, Atharamura, Longtharai, Shakhan and Jampui Hills—run north to south, with intervening valleys; Agartala, the capital, is located on a plain to the west. Tripura is the most literate state in India with a literacy of 94.65%. The inaugural flagging of Tripura Sundari Express in Aug 2016 by Suresh Prabhu made Tripura entering the broad gauge railway map of the country. The foundation stone for the much awaited railway track to link Agartala to Akhoura in Bangladesh was jointly laid at the programme by Prabhu and his Bangladeshi counterpart Md Mujibul Haque. ’Tripura Sundari Express’ was a weekly express running on Sundays and reaching New Delhi in 47 hours after travelling via Guwahati-New Jalpaiguri. Rs 968 crore was spent for Agartala-Delhi rail link. Addressing the gathering at that time, Prabhu said a regular train service between Agartala and Kolkata would be started next month. “Kolkata is the cultural capital of the country and Tripura has a long historic connection with it,” he said. On the Agartala-Akhoura railway link, Prabhu said it would be part of trans-Asian rail connectivity. Prime Minister Mr Narendra Modi, he said, is very keen to make northeast region a tourist hub. “We want to develop railway network in the entire northeast and want to make it a tourist hub. We want to bring Bangladesh into the same tourist circuit,” Prabhu said. Tripura, the Sanskrit name is linked to Tripura Sundari, the presiding deity of the Tripura Sundari Temple at Udaipur, one of the 51 Shakti Peetas and to the legendary tyrant king Tripur, who reigned in the region. Tripur was the 39th descendant of Druhyu, who belonged to the lineage of Yayati, a king of the Lunar Dynasty. Though Agartala was scheduled to get broad gauge facility much earlier and by Mar 2016, works for conversion in BG from a small meter gauge track from Lumding to Silchar in Assam was completed in March 2015 Freight services to Agartala had already resumed by then. 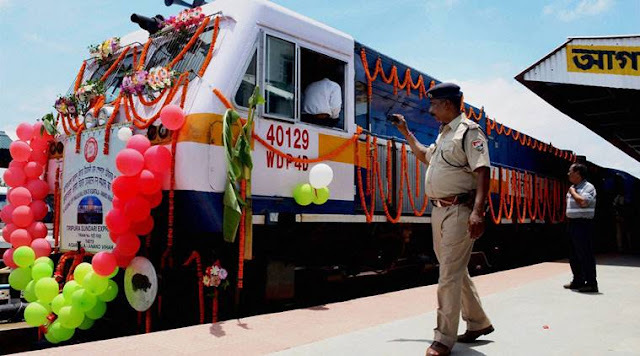 It was 31st July 2016 when Suresh Prabhu the then Railway Minister of India inaugurated the Agartala-New Delhi ‘Tripura Sundari Express’ linking the broad gauge with the rest of the country. On 28th Octr 2017 Rajdhani Express was inaugurated from Agartala to Anand Vihar Terminal, New Delhi.